I’ve been asked a number of times to discuss in detail how a horse can be improved with correct work; how musculature and posture can be changed. Intellectually we all understand the importance of correct work/exercise, relating it to human activities like something as simple as doing a sit up the right way versus the wrong way, and the implications – the development of a strong core or a week in bed with a sore back. The problem is that I don’t often know where to start. The topic is immense. Just thinking about it is overwhelming to me, trying to then share the information and not overwhelm the recipient is next to impossible. Moreover, I’ve discovered that hardly anybody seems to be able to execute even after they have the information. The task is always more involved than just knowing or having good intentions. You also have to have some skills and talent; patience, tenacity, common sense, an aptitude for critical thinking, good judgment and instincts, and the capacity and will to continually learn. If that’s not enough, it can often times be financially draining and time consuming. I can always find pictures of horses in need and point out what’s wrong, but rarely is there a chance to get ‘after’ pictures. Since a lot of us learn best with visual aids, pictures are important to connect all the dots. Additional to the pictures would be a comprehensive summary of treatment, exercises and the like. Following is an example that tickles the vastness of the topic. Thank you to Earthshadows (the human) and Capataz (the horse). Capataz was purchased with the intention to advance his rider in Dressage. We could nitpick a few things, but overall he’s well-suited physically to the task and should breeze through the lower levels on his way to medium. Except for one thing; he’s injured. I’ve marked the injury in the photo below, some might have seen and called it a ‘hunter’s bump’. I don’t care what you call it, or whether it appears on a horse that’s not head bobbing lame, or whether it’s on a horse competing successfully at a high level. It’s an injury, all day long, every day, and should not be dismissed or ignored. Indeed, when purchasing a horse this should, in more cases than not, be a deal breaker. It’s an injury that often occurs in horses that jump, race, and/or slip at speed. Fortunately (or unfortunately depending on your point of view), Capataz injured himself after his purchase. This at least meant that Earthshadows knew when and how it happened. The sooner treatment can be administered, the better chance of recovery. So it was a bit of a rough start for me and my horse. Within the first few months he spooked and had a bad fall on the cement aisle, his chest hit the floor and legs were everywhere. I’m not sure if he maybe had a pre-existing issue at this point, but this set him lame for sure. Not dead lame, but something was wrong. My coach at the time wanted to do nerve blocking, but it didn’t quite feel right yet to me. So before doing that, I had a certified chiropractor vet take a look at him, and she said his hip looked off. She adjusted it, but wasn’t sure if it would solve things. Soon I received a recommendation for a very talented lady that also did manipulation therapy (but not a vet). At this point, I was very skeptical, was never one to believe in these things. But she came out, and after some heavy adjustment (she had to pop his leg into his pelvis or something as equally gross–there was a quite the loud pop), the very next day, no longer lame. Just like that, after months of lameness. I was ecstatic. Of course, that meant recovery was only starting now. He had lost most of his muscle definition, and had now a very prominent calcium bump on his hindquarter that may or may not shrink. So I started having his bodyworker come out somewhat regularly (bodyworker suggested that it not be frequent), and we saw his pelvis hold itself together longer. For you see, his hip wanted to remain tilted the wrong way. At first, he would never stand square, legs in all directions. Now, I find him more and more standing naturally in a square position–he’s finding himself straight. But that was only half the battle. The other half was learning to ride him correctly. I went through a few coaches (and styles of teaching!) until I found the one I have now, one dedicated to riding from back to front, and about engaging those hindquarters. And so with strength coming back, his pelvis has remained correct even longer. Some points to take away from this example; even with early diagnosis and treatment, the rehabilitation of this type of injury to a horse is still time consuming with no guarantee of complete recovery. The longer the injury goes unnoticed or ignored, the more difficult it becomes to repair and the less likely the horse will fully recovery. Scar tissue, bone remodeling and calcification occur rapidly due to the amount of stress this area of the horse takes, and it’s not unusual to have significant, chronic inflammation and fluid build-up. I refer you back to the previous blog article Hind Limb – Part 1 where I discuss the attachment of the horse’s haunch to the rest of its body. (See second paragraph). Refresh yourselves on the stay system of the hind leg and imagine how if one of those joints is injured or stressed how that must affect the rest of the joints of the leg. Imagine too if just the surrounding area of one of those joints is affected how that too is going to have a trickle effect to the rest of the hind end. Keep in mind that our intent for any riding horse is to have it transfer weight from the forehand to the haunch via that itty, bitty LS joint. If there’s any sort of natural, structural weakness in the haunch; long loin, poorly placed LS joint, post-leggedness etc…, then not only is the potential for injury increased but also the amount of injury that can occur, with time added to rehabilitating such an injury since the structure contains a general inherited weakness. There are a lot of horses out there performing for their riders with loin/sacrum/pelvic/hip injuries of this sort, whether from direct or secondary sources. Lameness can be subtle from a shortening of the gait, or carrying the haunch off to one side, or as predominant as head-bobbing. But even if it’s not at first obvious or apparent (not everyone has an eye for subtler unsoundness) and the horse has continued to win in the ring, know that the horse is injured and unsound if any sort of topline or pelvic unevenness is in evidence. It is the nature of prey animals to hide illness and injury, and the nature of the horse to get along and please. Through compensatory actions (ie., travelling heavier on the forehand) the horse will more often than not, keep right on truckin’. In the case of Capataz, he dislocated his hip. This pulled all the soft tissue around the hip joint, around the pelvis, and up into the sacrum and loin, stressing the entire haunch. And even then he wasn’t head-bobbing lame. It may seem that the topic of this article has now changed from the opening paragraph, but I assure you it’s all very much related and intertwined. One of the first things we must make sure of when wanting to correct the horse’s musculature and posture is that an underlying injury does not exist. While remodeling muscles and improving posture can take several months, it’ll never happen if the horse is suffering from an undiagnosed injury. ← Virtual Horse – A MUST See! Being one who is very curious about this whole process, I am super excited to see this! I’m really glad injury BEFORE work was brought up. I think that is a concept not widely thought of, at least around the horsemen and women I know. For that matter, neither is riding in a correct manner/asking the horse to move in a correct manner. I would love some day to get a chiropractor out for my horse. Just to see if anything is out of whack. He is getting on in years and I’m sure its happened. But until that is possible I am very religious about checking his back/neck/etc for anything sore! It is interesting that so many don’t realize that horses injure themselves like this all the time and it often happens when they are young and not even in work yet. Every time I see a horse wipe out in a field while playing I cringe because the chance that that horse didn’t just pop something out of alignment is next to nil. Sometimes it’ll slide right back into place, sometimes over several days, sometimes when the horse rolls, but lots of times it doesn’t. I remember one time when I was riding my horse out in the field, just trotting around and he stubbed a toe and tripped a bit in a small divot. It wasn’t violent or anything. Immediately I felt he wasn’t quite right in his movement. I took him back to the barn and pulled off his saddle to find a small ‘bump’ sticking up just behind his withers. With just a little bit of massage, I was able to slip that bone back into place. My horse let out a big sigh and the remaining lump (inflammation) dissipated over the next few hours. I gave him the next day off to heal and he was fine the next time I got on him. Riding well takes an enormous amount of athletic skill, muscle control, flexibility, strength, especially in the core. Riding is dissed as a skill in the modern world, as soon as horses as the main mode of war making and transportation passed, and the old cavalry officers with good equine educations started to die out, no one thought of anyone who rode as an athlete. “The rider just sits there and the horse does all the work”. People still argue that riding events don’t belong in the Olympics because the rider’s aren’t athletes. So many rider’s approach riding with those assumptions buried inside themselves, they work their horse, they don’t need to work on themselves. And even people willing to work on themselves aren’t necessarily born athletes, they take years to get good, it is never easy. And the absence of qualified teachers is another problem for those who wish to get better. The lack of instructors with a stable of schoolmasters is another problem. If you have never ridden a horse that was right, never been able to feel collection, how long must you practice using hit and miss experimentation as a green rider on a relatively green horse before you develop feel? And how many bad habits can you unlearn? For most of us, we go through many teachers and spend years unlearning what we spent years trying to learn because we figure out too late that we didn’t know enough to even be able to pick a good teacher. 1. Sufficient physical conditioning to be able to hold yourself erect on the ground in good balance, if you slouch standing still or sitting on a straight chair, you will slouch sitting on the horse. Yoga, pilates, dance, martial arts training are all ways to improve your core strength and balance. If you can’t stand on one foot and move the other leg and your arms without falling out of balance, you can’t ride in balance. Be able to release tension in your shoulders. legs and back so that you can stretch and remain flexible to move with the horse. Note that one does not have to be skinny to do these things, I certainly am not and haven’t always been, but I ride better when I am not fighting my own fat rolls to get thighs and arms in position, etc. (which is not to say I ride well, no one need worry about me as a competitor). Invest in Sally Swift’s book and a yoga dvd and you’ll be well on your way to meeting goal number 1. 2. Learn all of the tedious time consuming basics of getting your body into the correct position to ride. Again, Sally Swift, Suzanne Von Dietz, are good sources in book and DVD. That means learning to stand in balance in the stirrups without pinching with the knees and flopping back and forth (trust me, voice of experience, I flopped with the best of them), learning to relax yourself into correct posture with the ear, shoulder, hip and heel alignment, western or english, to the extent your saddle lets you (and then you’re going to look for a better saddle that also fits your horse). You can’t pull your shoulders back, thrust your legs down, etc., trying to do it by muscle power will interfere with flexibility and balance. Realize that you can’t pull your leg up to use it, stretch it down and use the sartorius muscle (and yes, that actually has been talked about on this blog before) which leaves the knee out of the equation). Learn to post correctly, you are not straightening your legs and standing up to post. You are using the core to pull your pelvis forward and up towards the pommel. Learn to find elbows, straight arms trying to be still bounce in the horse’s mouth. Bent arms with visible elbow bend allow the upper arm to swing forward from a relaxed shoulder to follow the horse’s mouth while allowing the lower arm to be still. Learn to hold reins correctly, keeping hands upright, thumb on top, no puppy dog or piano hands, those hands can’t softly communicate with a horse’s mouth either. Practice ad nauseum at a walk, then start over ad nauseum at the trot. 3. Learn to feel the horse’s feet, know which feet are grounded, which are off the ground by feel not craning your head and neck to look. This usually takes a helper, find someone willing to spend lots of time getting you to call out footfalls. Learn the pattern of the footfalls for each gait. If you can’t feel the feet, the application of cues will always be hit and miss, you won’t ever know the timing, it will always be a guess. The feel of the feet is the pathway to all complicated manuevers. If you can feel the feet, know which is going to move next, etc., then you can learn to cue them to move at the correct time for forward and lateral movement. Feel of the feet is also the start of being able to get a good stop. 4. Learn how to time your leg cues to the movement of the horse’s rear feet. The most basic physical conditioning exercise for the horse is to work to be straight. Being able to move the rear foot of the horse to fall into line with the front foot of the same side is to be able to encourage straightness. A horse that is able to be adjusted from the rear can be directed to bend correctly. All collection will flow from creating straightness through correct bend. That all boils down to being able to step the rear foot towards the midline to fall directly into the track of the front foot. All higher level bending exercises, shoulder fore or in, haunches in, is the ability to move the feet off of the track. If you can move them on, you can move them off. Moving straight, all by itself, allows a horse to move in ways that self cure a lot of nagging problems, it allows the correct muscles to be engaged to move correctly, build more muscle to protect joints and ligaments from strain, it saves feet from imbalances. Much of this can be realized at a walk, too many people want performance before they have the basics. A common mind set I seem to come across a lot, is the idea that anything a horse does that isn’t what you wanted is wrong. No one ever gives a thought to maybe you the rider are wrong. Even when it comes to pain! There are a lot of people who don’t see certain reactions as pain. Or even stress. Horse doesn’t want to be saddled, grumpy about cinch? Aw well, he is just being (insert horses name). Checked the horses back myself.. Holy mother of pearl was that poor boy sore! Horse nervous wreck out on the trail.. well, maybe its your death grip on the reins. I think I would be a little stressed out too. Also got to hop up on this horse. Let her have her head and viola! Calm horse. I understand this is not intentional cruelty.. but why does it seem like no one even entertains the possibility that they are wrong? It’s always the horses fault. When really.. its actually always our fault. I had an interesting confirmation of this last year. I was booked for a pricey and interesting ground work/obstacles clinic at our barn. The Paint Mare came down with an abscess in a front hoof the week before and was still a bit ouchy on the day. I decided to attend the clinic anyhow, just take it easy, as it was non-refundable, low-impact mostly, interesting to watch the other horses, and the Paint Mare had really loved the workshop the last time it came around, climbing up on circus boxes, playing nose soccer, that kind of stuff. She was not showing a limp at the walk on the arena footing, and I didn’t ask her to climb up and down off things where she’d land hard. But even so, she basically lost all her confidence and sense of fun. She didn’t want to go near the bag of tin cans or walk through the “car wash,” things that wouldn’t bother her in the least if she was feeling good, and she ignored the rodeo ball. I concluded that basically, she wasn’t going to take any risks if she didn’t feel 100 % okay about her ability to get away from things. It made me realize that excellent health is perhaps the necessary basis for a confident horse, and it certainly made me think about all the spooky horses who have ongoing aches and pains. That is definitely one way my thought process have changed. Anytime I see a horse “missbehaving” or acting out.. I tend to think there must be pain somewhere. That or rider error. Excellent post… and I want expand on point 1… just as Mercedes points out that we need to address pre-existing injury in the horse… ditto for the rider. Pretty much all of us with have muscle imbalances and joints out of alignment, from past falls or even just too much sitting in an office chair. Even kids/teens are not immune, the very young can have problems caused by growth spurts. If you have that one part of your body that just doesn’t seem to want to do what it is supposed to, that thing that riding instructors have been nagging you about for years… it’s probably not that you’re lazy or not trying to fix it, but that you physically CAN’T. For me it was my right leg… almost 2 years ago I bought a CD of pro photos from a 2 week horse show and in every single picture my right leg had slipped back. Left leg positioned fine, right leg too far back. Coach had been telling me “keep your right leg at the girth” forever. I was trying. Seeing the photos and seeing how consistent the problem was made me seek out extra help. I now see a physiotherapist who is an equestrian specialist. She has come to watch me ride, also sees me in her clinic and does adjustments on me plus gives me exercise programs to follow. I am a long way from perfect, but several adjustments and about a million one-legged squats later my right hip is much stronger and I can keep my right leg correctly positioned most of the time. I *never* would have got there from just trying to hold my leg properly while on the horse. So I guess I am saying to go even beyond reading Sally Swift and getting a yoga DVD (which are still good suggestions!) and get yourself checked out by a professional. While yes, it is EXTREMELY difficult, humiliating, exhausting, etc. to be a green rider on a not so finished horse.. it isn’t impossible to learn this stuff! I think that is one of the biggest mistakes we as riders make. We think we aren’t smart enough, good enough, rich enough to accomplish these goals. No, you damn well aren’t going to get there quickly. In fact it took me about four years to get to a point where I realized and understood that there is a correct way for your horse to move, for you as a rider to use yourself, balance, cue etc. It took four years to realize how WRONG I was. And you certainly will make mistakes. I’ve had to go back and fix so many problems that I myself created. But I learned from my mistakes. I took notice of my horse and what he had to say. In fact I think that is what has taught me so much. LISTENING TO MY HORSE. Any blog I came across;this one, Fugly, I payed attention to. I tested each piece of information myself. If it worked, awesome, if it didn’t, well throw it back in the box of tricks for another time. I’ve spent hours on forums. Reading through other riders problems and how they worked through them. I’ve watched about every single Art2ride video in existence. Horse magazine? I pick it up! I’ve had maybe a total of three lessons in the four years I’ve owned my horse. I’ve learned more by trial and error than I ever did at those lessons. Not discounting lessons at all. There is just no one around here that I feel could teach me much more than I already know. I’m not being prideful. I promise. I know how much I DON’T know. Its overwhelming how much I don’t know. Sometimes I want to give up. But I think about how much I’ve learned, how far I’ve come, and I know that I CAN do this. We all can do this. It’s just whether or not we are willing to try. It isn’t impossible to learn, but as Ray Hunt liked to say, “It’s simple, but it isn’t easy”. And a beginner can learn on a green horse, and because of the way things are, for most people that is the only option. But your points about people blaming the horse fall in with what I said or at least meant to say, fixing the horse starts with the rider. Most errors are rider induced and the riders don’t know it. Pain is often overlooked, people can’t recognize it or refuse to recognize it, because in many cases that would implicate them as the problem, they caused the pain through bad riding, bad equipment, etc. The internet is a wonderful source, there is lots of information, but so much of it isn’t trustworthy, and for a beginner, whether it is a teacher in person, or a video on the internet, it is hard to tell good and bad, especially with people that do a good job of talking about what they are doing and distracting the viewer from seeing what the horse is saying. That is what makes this blog valuable. If you can learn how the horse’s body is supposed to be, how it should look in proper movement, you never have to trust what someone says about their techniques, you can just watch the horse. If the horse is hollow, lower neck bulging out or just tension that keeps the neck from being correct, hind legs strung out behind, sewing machine motion of the front legs, bad muscling, etc., doesn’t matter if the rider talks a good game about soft hands, correct riding back to front because the horse is telling you they can’t ride the right way. I think that is one of the most important things I’ve learned here.. Watch the horse. Here’s my understanding of Hunter’s Bump; Mercedes, please correct me if I’m wrong! Hunter’s Bump is also called subluxation (partial dislocation) of the pelvis. It’s caused when the muscles of the loin are stretched and the pelvis rotates forward, so that the bony points of the pelvis are pulled up and more visible. It can be either chronic from low-grade stress on the loins, or acute, from a one-time injury. If acute, you’d probably notice the injury. If chronic, caused by bad riding, you might never notice it, might just think it is a conformation issue, and never connect it to how your horse is slightly “rein-lame,” or trailing in the hindquarters, or stepping uneven behind. It is called Hunter’s Bump because it was at one time noted as being endemic in hunters, but I have seen it even more in low-level amature competitve dressage horses, and in lesson horses in less well-managed programs. The stress is caused by being ridden with the back hollowed, rather than arched up, in the manner that the video in Mercedes’ previous posting condems. Hunters can get ridden on the forehand with the back hollow to get the long, low neck, and then asked to jump while on the forehand, so they heave themselves over the jump rather than spring over. But dressage horses also end up being ridden on the forehand when the rider “drives the haunches into a fixed hand” and the horse rolls over in front, gets a lot of knee action, and trails the hind legs. A horse with a longer loin area will be more susceptible to Hunter’s Bump, whereas a horse with a short strong loin will not get a bump from the same amount of bad riding, but will show the strain elsewhere. 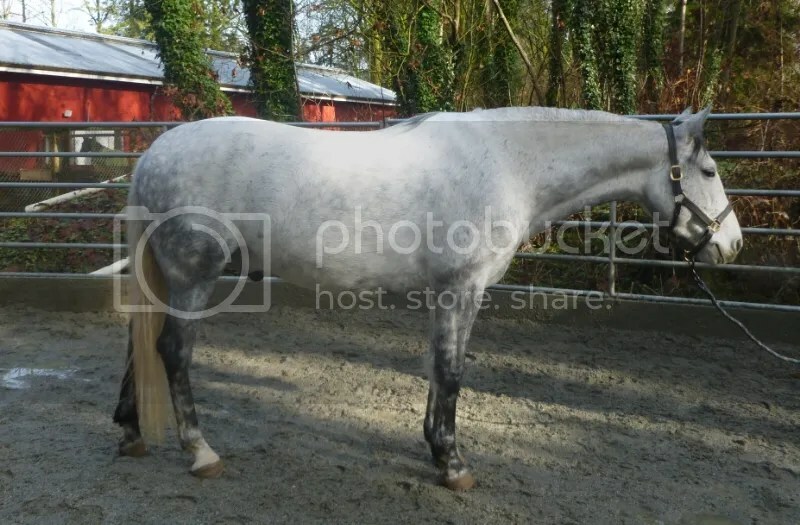 The horse pictured in this post got his bump from an actual accident, which makes sense, because he looks to have the kind of short strong back and loins that would not develop one easily otherwise. When I got interested in the topic, I was surprised how little information was available on-line, and how much of what there was, was rather fatalistic, and saw the bump as a blemish, rather than an injury, and something that didn’t impede performance. Perhaps that is because fixing requires changing how the horse is worked, and that might mean leaving a competitive discipline where the horse needs to be worked wrongly in order to meet the demands of the show ring. In my observation, Hunter’s Bump can go away with a change in program and chiropractor work, and it does always seem to accompany impeded performance in the hind end, though at a level that many riders and even coaches cannot always see. Of course, the points of the pelvis are also visible when a horse is underweight, or has had drastic atrophy of the muscles in the hindquarters. Of course, a severe dislocation of the pelvis will make the muscles atrophy, as this guest poster reported on her horse. As I’ve spent a good chunk of this season trying to match people to horses and horses to people I’ve seen a bunch of wrecks. One quite recent, being sold sound, appeared inable to flex in the pelvis. It was if the horse was attempting to w/t/c on tip toes behind to avoid full engagement of the loin. And the loin was long and obviously a mess though quite different than the gray above. There was a significant dip between the SI and I assume L6? And there was a very bony, lumpy protrusion that could be seen from a mile away at or near L6m with an overall convex lumbar altogether. I am an eternal optimist when it comes to horses, I want to believe that all things can be fixed with love and better riding. It’s hard for me to say no to any horse in a bad situation but this one said ‘not a chance in hell’ could it be fixed. I still think I could’ve made it better, part of me wanted to try, but thankfully good sense said otherwise. I still wonder what causes a horse to end up with a convex back and an somewhat inverted SI connection. 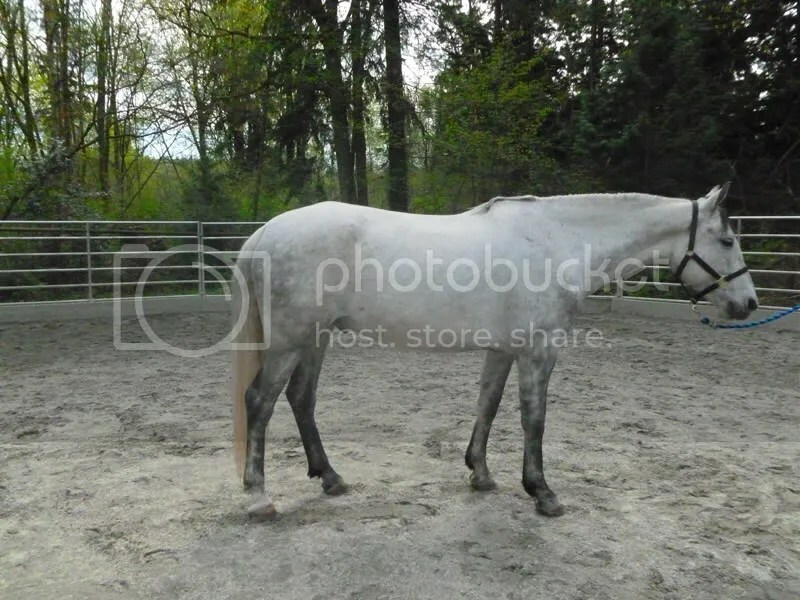 http://www.foxtrottercolor.com/horses_for_sale/Bell%20PIC00016.jpg Almost exactly the same back. This horse almost looks roach back too, or is that just the SI/lumbar problem making things look whonky? Quite injured. Atrophy isn’t just present in the haunch, but also the entire length of the back. Also appears to be some digestive problems too, that may or may not be related to the injury. Pain can disrupt the digestive process. Direct to how racehorses get like the one you encountered: So many begin carrying riders as long yearlings, with people under the impression because they are height-wise and muscularly-wise looking mature, that they skeletally must also be mature. We here know that the spinal vertebrae don’t finish maturing until horses are 5/6 years of age. We also know that horses are not designed to carry weight, even when fully mature. Therefore putting rider weight on a weak, immature structure like the back of a 1/2/3 year old racehorse all but means we should see topline injuries. Combined with the biomechanics of racing, that is transferring weight to the forehand, dropping the base of neck, hollowing the back – injury becomes inevitable and the miracle is that any horse following that path could escape the track unscathed. The fact is, there don’t. Ever. I’m with you on the relativity of the horse’s age to what is asked to carry and how it performs. TB’s are also at the disadvantage of having too light of bone, purposely long loins, poorly shod hooves, etc. I also feel that after-track life often contributes to the perpetuation of backs/loins that are already strained. People generally want OTTB’s to event and jump. They’re naturally athletic, generally tall and can fill a saddle for those unable to spend 5 figures on a WB. The problem I see is that people are in too much of a rush to get to the jumps. The horses aren’t learning to use their bodies, they’re ridden hollow, heavy to the hand and extremely tense. I’d rather see horses fresh off the track taught flex, yield, soften to the hand and leg long before they see their first jump. Trotting and cantering round and round with tension isn’t teaching the horse a thing and it certainly won’t help the horse heal physically or mentally. There are plenty of war horse TB’s that have run their hearts out that are in reasonably good physical condition. The breeding stallions I saw in KY were ridden regularly and appeared to be thriving. They certainly didn’t have highly visible convex backs or loins which leads me to believe that more cold be done to help these horses enjoy life after the finish line. Speaking of injuries, I wonder if anyone has any suggestions on how I can help my gelding. About 18 months ago now, my gelding walked through a plain wire fence. The wire cut into his offside hind just below the hock. At first it didn’t seem a serious injury, the vet cleaned it and bandaged it, gave me some penicillin and that was it. A week later, however, he started to ‘knuckle’ on that leg – instead of putting his foot down flat, the toe of his hoof would hit the ground first would roll forward onto his fetlock joint. The vet came out again and decided the extensor tendon had been damaged by the wire – probably strangulated but not actually broken. So he was put on 4 weeks stable rest with the leg heavily bandaged, then another four weeks in a small yard. I then gave him four months in a hilly paddock to make absolutely certain it had healed up as much as possible. The wound closed over and the tendon seemed to heal up pretty well. During this time we started doing short hand walks to see how it was holding up. Apart from a very occasional knuckle, he seemed fine. So about December last year I started to bring him back into gentle work, starting with 15 minutes a day walking on the lunge, working up to half an hour, introducing a bit of trot work, then starting to ride him again. He seemed to be going fine. I was riding him with a tendon wrap on to give the tendon a bit more support. He still knuckled over sometimes, rarely more than once a ride, and much less often with the wrap on. We went to a show, pony club, everything seemed to be going fine. Except over the last couple of months, I’ve increasingly noticed a bit of crookedness in his hindquarters. It’s most noticeable at the trot, and only when you’re on him – it’s really hard to see from the ground, but he short strides a little with the injured leg, and I think it’s starting to cause the muscles in his hindquarters and back to change. If you can imagine how it feels to sit to a canter when the horse is disunited – that feeling that their backend is twisting slightly under you? that’s sort of how it feels when I’m trotting on my gelding. I have called my vet who suggested going back to the walk and doing hillwork and straight lines to try and straighten out his musculature and strengthen the bad leg, which we’ve been doing. I was wondering if anyone on here has any other suggestions that might help correct that sort of thing? Thanks in advance. Get behind him on the long reins and look at him. The problem is that the injury was never fully diagnosed. The vet made an educated guess and while he may have been right, there should have been ultrasound to assess the extent of the damage and confirm what he suspected. Only then can the most proper treatment be applied. The leg should be ultrasounded now to determine the extent of the damage, scar tissue, inflammation, etc… And probably a wider area of the leg/haunch gone over. As an example: It’s quite possible that there are now subtle hoof changes from the horse not weighting the foot/landing on the foot correctly. Yes, the horse is going to likely need to be very closely watched and shown how to be straight again. The horse won’t simply travel straight because it’s walking up a hill, you have to put him straight each and every step without overdoing it and causing him to brace, evade, or tense as a result and creating other problems. It would have been much easier to do this right off since the horse has now had 18 months of compensating. That’s what annoys me most about the situation. The vet should have completed the diagnosis and provided you with a comprehensive plan of stretching, massaging and rehab, or at least explained to you that you’d need to get someone else who specializes in that. If things were going well and now aren’t, it may be an aggravation of the old injury, or something new happening. You don’t want to assume, so more vetting and follow up with body work may be necessary. 1. Backing with a relaxed and lowered head posture one step at a time. In other words, one step from one diaganol, a distinct stop, step from other diaganol. Try to keep head lowered and neck stretched, you don’t want the horse doing this hollow, that will not help. The steps should be clean, no dragging feet creating an ’11’ in the dirt. This asks the horse to fully and correctly engage at the loin, lift the back and articulate the rear joints bringing the foot off the ground and then placing it down flat. It fully loads the legs, the big belly muscles and sub-lumbar muscles do their work, joints do full range of motion and full weight bearing. By using the big muscles correctly, the tendons and ligaments are stabilized as they are supposed to be. 2. On the ground, engage the hindquarter by walking a circle and asking the inside hind to step up and towards the midline. Again, head should be relaxed, forward down and out posture, back lifted slightly, and inside hind will articluate joints and bear weight. You may notice a difference from right to left circle as to how easy it is for the horse to step up and under. To the extent the horse cannot do this evenly on both sides, you are seeing crookedness. This is hard work, don’t work either side for extended periods, ten minutes total would be plenty. Over time, if you are asking correctly, the ability of each hind to carry weight equally should improve. The goal is to track up, ie, be able to have the hind hoot step in the front hoof track (not overstep or be off to either side). Up above, I mentioned this is an under saddle exercise, this is the in hand of the same thing. When riding the hills, what you will do is adjust each hind to come under and carry weight equally each step of the way. To the extent that the horse attempts to protect one leg by not coming under and bearing weight, he will go crooked. The stronger leg will be pushing you off to the opposite direction in most cases. Horse has to be straight up and down the hill. Thanks jrga, I will certainly try both those things. I’m also intending to get a chiropractor out to look at him and make sure there’s nothing else going on, if he’s got something out of alignment or whatever. Unfortunately Mercedes, I’m in an area of rural Australia where we don’t have access to a lot of specialist facilities. Our local vet practice is primarily a small animal clinic wherein only a couple of the vets are trained equine vets/dentists/barefoot specialists and perform all those functions. It’s a good 3-4 hour haul to the nearest specialist equine vet who have access to ultrasounds and things like that. I suppose that’s likely the reason for the unconfirmed diagnosis. I wasn’t given any indication as to how to bring him back into work other than to start slow by hand walking him, and was led to believe giving him the extra time off would ensure that the tendon was properly healed up. Depending on the what the chiro says (also a vet?) and the outcome of trying a different approach, you could still consider hauling him to that specialist. You do at least have that option. Fingers crossed for you guys. This discussion begs the question….how much disposable income does a person NEED to have in order to own a horse responsibly? My opinion is probably much lower than most, based on my own experiences. I suppose I’m opening a whole ‘nother can of worms. Clearly some of the above will not apply depending on the situation or may be a minimal cost – such as if you grow your own hay. Then after having that yearly total of expected expenses you need to build in a percentage over and above that since none of those are ‘fixed’ expenditures. Hay and grain prices often fluctuate, a horse may require shoes later in the year when originally it was barefoot and so on…. Some research has to be done in this area to make sure you have enough room should all things rise in cost in one year. Then you need an ’emergency’ fund for such things as unexpected vet costs, having your vehicle and all your tack in it stolen and so on. Horses ain’t cheap and trying to do them on the cheap often gets the horses in trouble. Yes, a number of things I listed will not apply to all, but still things that should be considered prior to purchase, as some will change their minds about what they want from their horses. In terms of insurance, I was thinking more along the lines of medical insurance for the horse for such things as colic. The cost of colic surgery is prohibitively expensive for the average owner if the entire amount is coming out of their pockets. Since that is a real threat, and since many of us love our horses like our children, people might want to consider planning ahead just in case. But even without that kind of a cost, horses routinely get hurt and/or need diagnostic work that can turn expensive really quickly. Unless one thinks of horses as disposable… It happens to people who own dogs and cats. Animal ownership ain’t cheap. If a person is really good at picking healthy individuals AND gets lucky (like the animal has no health issues its entire life and dies in its sleep) then general animal ownership can be quite affordable. I agree with your general sentiment, except that I do think horses should be viewed as a luxury type of item with huge responsibility. And I don’t mean luxury as in only the very rich can afford. We all know that making sacrifices/certain decisions in life can afford us to own/do things in life that we otherwise wouldn’t be able to, but I’ve read/been told more times than I care to remember; ‘I can’t get the vet/farrier/healthcare professional/saddle fitter out yet to look at my horse until I can save some money.’ To me that’s generally not acceptable (may be okay for a short term when the issue is not serious and the person is willing to stop what they are doing until it’s addressed – such as riding the horse with an ill-fitting saddle until a new saddle/old saddle can be restuffed). We are the caretakers of these animals and therefore are responsible for all their needs, not just the ones we can afford in the moment.